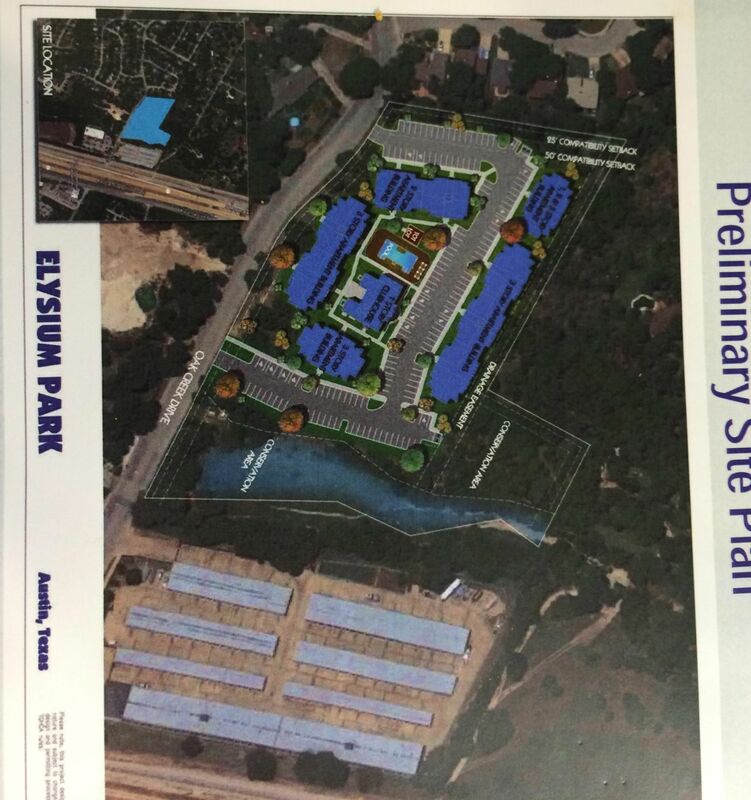 This post is a quick reference to updates and links to information about the Elysium apartments project near the eastern end of Oak Creek, such as to documents on file with the City about the project, the zoning process, water quality standards, the State agency involved with Housing Tax Credits and more. We will update it as we learn more. Join our private Northwood Facebook group for updates (requires a Facebook account). All residents of Northwood and adjacent neighborhoods are invited to join. We also share updates through NextDoor.com. They are seeking Housing Tax Credits so they can offer reduced rents on a number of the units. 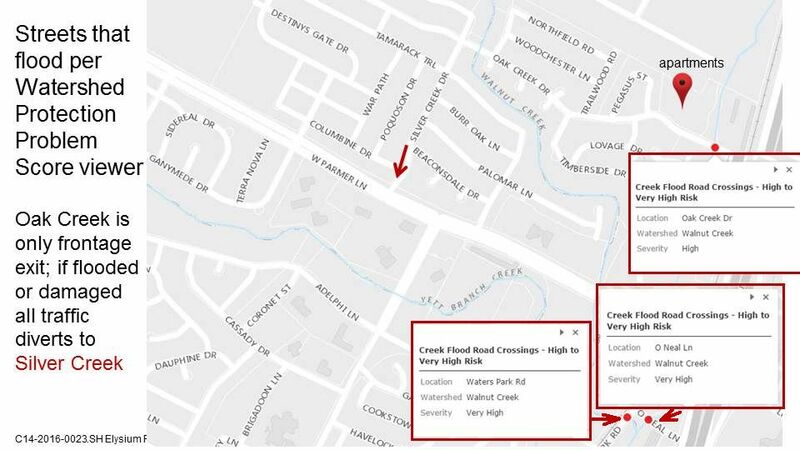 All nearby neighborhoods oppose apartments at this location for many reasons including flooding, environmental, traffic and safety, which are explained in detail below the updates. Historical minutes of a 1979 City Council meeting with a requested zoning change for 3100 Oak Creek through 3616 Oak Creek (our case starts on page 14). This month developer began construction. As of this date, they have installed a chain link fence around the site with black fabric, and some gravel has been delivered to the site outside the fence. It appears that through a creative mechanism the FOR-PROFIT developer/ development may not have to pay property taxes. (starts on page 31 of our handout to the City Council, which we also submitted to the TDHCA). 4% tax credits approved at Oct 11 2018 TDHCA board meeting video (our portion starts at -about 5 min 15 sec into the video for Elysium application 18422’s noncompetitive 4% tax credits request. A TDHCA staff member starts with the intro. All discussion until motion and vote goes until about 28 min 20 sec). Several members of the apartments opposition work group did extensive (amazing) research to document our concerns; we submitted them to the TDHCA and they are on record. A neighbor’s email opposing the apartments starts on page 35; Northwood’s (extensive) packet begins on page 39. We show documentation for all of our statements, including ones which the developer disputed. Board Chair JB Goodwin, who is also a realtor and is familiar with this area, voted against the 4% but it still passed. The next step will be for the AHFC to approve the up to $13 million bond. a hearing and public comments regarding the issuance of up to $13 million of multiple family housing revenue bonds to be issued to finance the development Elysium Grand apartments video and transcript (Elysium starts on page 2, 11:30). The City Council voted to approve the bonds; Mayor Adler also requested a copy of our speech. We provided it, with extensive documentation to him, the rest of the council members and also to the TDHCA before their Oct 11 meeting. 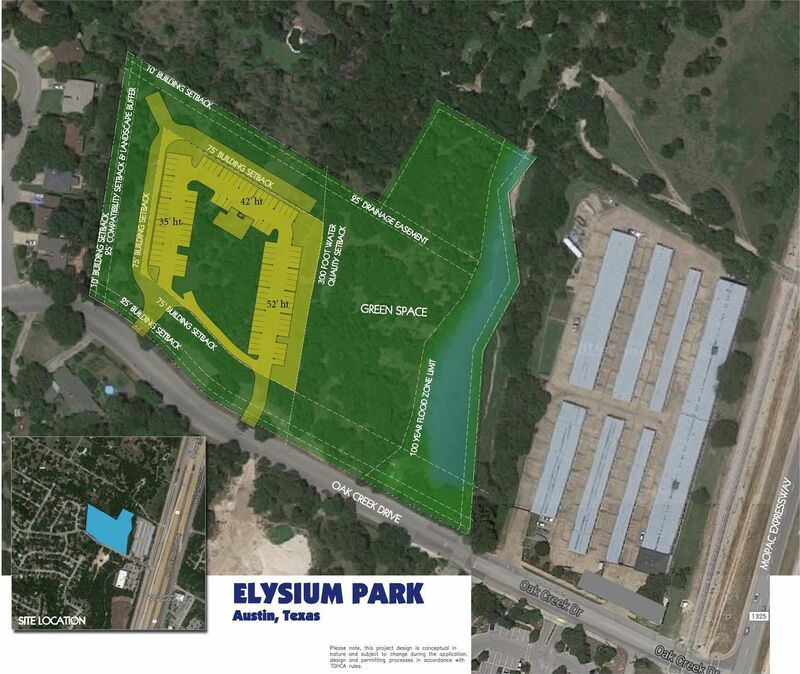 The 4% housing tax credit for Elysium Grand’s application 18422 was scheduled to be presented, discussed, and voted on during the TDHCA Board Meeting on Thursday, September 6, 2018. Without prior notice, that item was pulled/excluded from the agenda; but since it was posted on the agenda, a representative from our neighborhood area was able to speak in front of the Board and stated reasons why this site is unsuitable for the scale of the project proposed. Video of the meeting; neighborhood speaker begins at 5:20. Attend the June 28th TDHCA board meeting if you wish to speak to the board regarding the project. The date of the board meeting is subject to change. We will keep you posted. You can also write the TDHCA. If you wish to provide written comment deadline for the June 28th meeting is June 19th. January 2018: they did not receive the highly competitive 9% tax credits in 2017. April 2018: they submitted a request for the 4% tax credits. August 2017, despite strong opposition from Northwood the City Council voted unanimously to approve the zoning change from IP-CO (which would allow a neighborhood office or similar development) to MF-4, with a maximum of 90 apartments and up to 5 floors in height. Review cases – zoning site plan cases and site plan review cases (current cases being reviewed; may not have needed a zoning change). (added 9/16/18) City’s web page on Atlas 14, the National Weather Service’s historical rainfall study that shows that Central Texas is more likely to experience larger storms than previously thought. This means that severe flooding is also more likely. 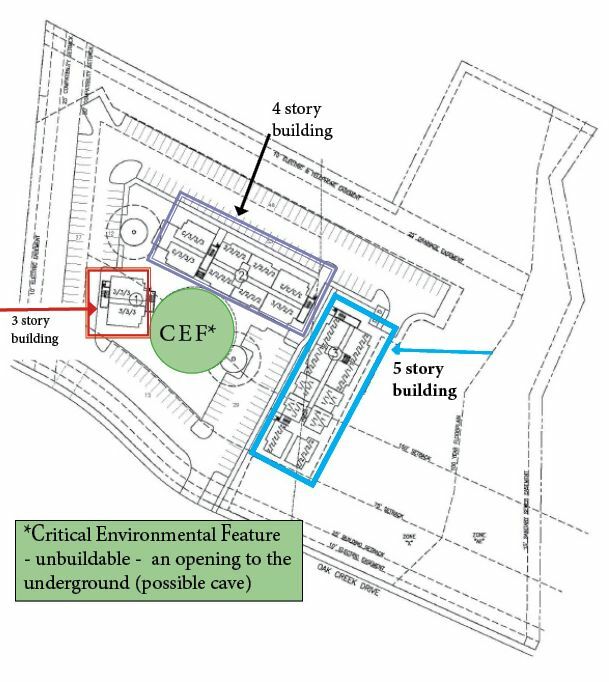 TCEQ drilling reports – underground voids, caves, etc. A number of these individual reports list “underground voids, caves, lost circulation”. Lost circulation means the underground stream goes… where? 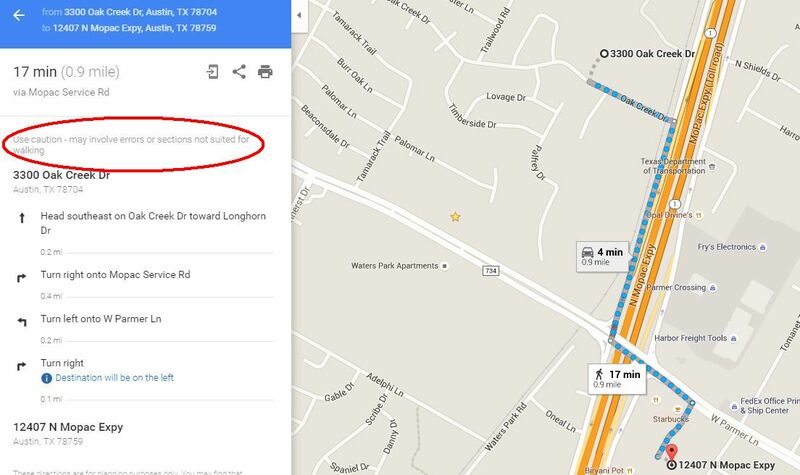 City Hall is located at 301 W 2nd St, Austin, TX 78701 (map), directly across from the S. 1st Street bridge. There is ample parking under the building, including for disabled visitors. The entrance is on Guadalupe St, which is one way south – turn north on Lavaca and turn left onto Second Street and again onto Guadalupe. Important: Take your parking ticket with you to be validated (outside the Council room) otherwise you will have to pay. Texas Department of Housing and Community Affairs manages the Housing Tax Credits, (aka “affordable housing tax credits”). See the Information Updates section at the top for the latest updates on the housing tax credits request. This recording includes the statement of the resolution for the requested housing tax credits for this project, the Council’s discussion, presentations by both developer and neighborhood and the Council’s vote. http://austintx.swagit.com/play/02112016-632 (we are item 5, part 1 and part 2).